The Plain of Jars in central Laos is one of Southeast Asia's most mysterious and misunderstood prehistoric places. Around 90 sites scattered across miles of rolling landscape contain thousands of large stone jars, each weighing several tons. Despite the best efforts of archaeologists, the origin and reason for the Plain of Jars remain a mystery. The vibe around the Plain of Jars is eerie and somber, comparable to the same feeling people report at Easter Island or Stonehenge. Standing among the enigmatic jars is a sobering reminder that we as human beings do not have all the answers. Only one enormous jar, located at the site closest to town and most visited by tourists, has a carved relief of a human being with knees bent and arms reaching to the sky. Only the recent discovery of human remains near the Plain of Jars has allowed the site to be dated. Archaeologists think the jars were carved with iron tools and date them back to the Iron Age, around 500 B.C. Nothing is really known about the culture that painstakingly carved the stone jars. Theories about the uses of the jars range widely; the leading theory is that the jars once held human remains while local legend claims that the jars were used to ferment lao lao rice wine. Another theory is that the jars were used to collect rainwater during the monsoon season. In 1930, French archaeologist Madeleine Colan conducted research around the Plain of Jars and discovered bones, teeth, pottery shards, and beads. War and politics prevented further excavation around the jars until 1994 when Professor Eiji Nitta was able to conduct more research on the site. Millions of unexploded objects from the Vietnam War remain in the vicinity making excavation a slow and dangerous process. Many of the jars were split or knocked over by concussion waves caused by intense bombing during the war. Not surprisingly, the site most frequented by tourists is the one closest to the town of Phonsavan, the base for seeing the jars. Known simply as "Site 1", this is the first stop on the plain and a must-see for observing the only decorated jar found so far. Although you will be harassed by guides and touts in Phonsavan selling tours, the only real way to enjoy the Plain of Jars is to do so at your own pace and lost in your own thoughts. Exploring on your own shouldn't be a problem, only a small trickle of tourists tend to make the journey out to see the jars. Once the threat of unexploded objects is minimized, Laos intends to turn the Plain of Jars into a UNESCO World Heritage Site, opening the floodgates to tourism. The stone disks on the ground are often mistaken as the lids to the jars, but this is not the case. It was concluded that the disks are actually burial markers. Only seven of the 90 jar sites have been declared safe enough for tourists to visit: Site 1, Site 2, Site 3, Site 16, Site 23, Site 25, and Site 52. 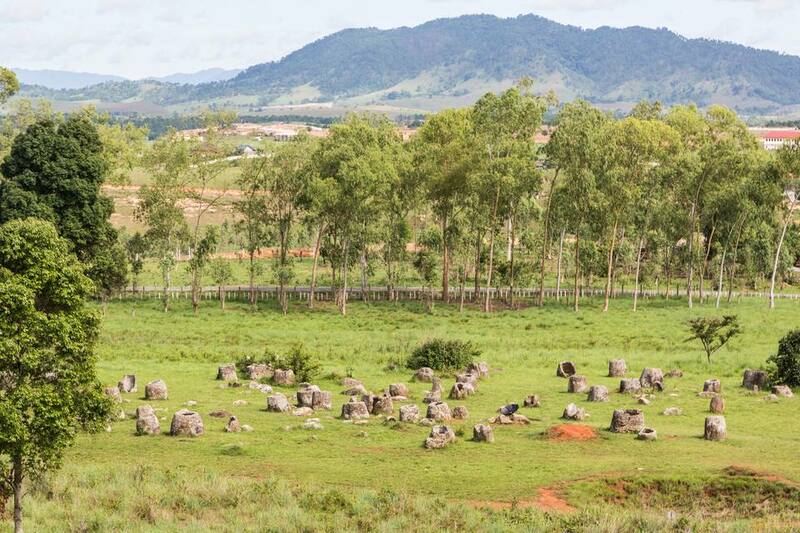 Site 1 is closest to town and receives the most visitors, but is not the best representation of the Plain of Jars. Site 2 is accessible from Site 1 by motorbike or tuk-tuk and then Site 3 can be reached by an easy hike. Site 52, the largest known site containing 392 jars, is rarely visited and can only be reached by foot. Always stay on the signed paths when walking between jar sites. Warning: The picturesque, serene landscape of the Plain of Jars may seem inviting, but before wandering off to explore first consider that Laos is the most bombed country, per capita, in the world; an estimated 30 percent of all the munitions dropped remain unexploded and still deadly. Always stay on marked, well-worn paths when walking between jar sites. Stone jars broken apart by shock waves caused by carpet bombing in the 1960s. Stone disks on the ground used as burial markers. Shells, fighting positions, destroyed tanks, and other war scrap left behind. "Craters" restaurant and the Mines Advisory Group shop located nearby in Phonsavan. The small town of Phonsavan is the capital of Xieng Khouang province and is the usual base for visiting the Plain of Jars. By Bus: Daily buses run between Phonsavan and Vang Vieng (eight hours), Luang Prabang (eight hours), and Vientiane (eleven hours).